I know we all count our children as a blessing but we are really blessed if the time comes when our children become our teachers; teaching us things about ourselves and how to “be” in the world. Well, let me go on record and say that I am REALLY blessed! Many of you have seen this picture of Clarke on Ruth’s page but let me share the story and lesson behind the picture. Considering all that she is involved in, Clarke has maintained a solid B+ average for the past couple of years. She is a member of the student council, number 3 seed on the varsity Tennis team at her school (15- 20 hrs per week practicing) and she’s just 15 years old. Let me go on record and say I was doing NONE of that when I was 15 (16,17, 18, 19 or 20)! 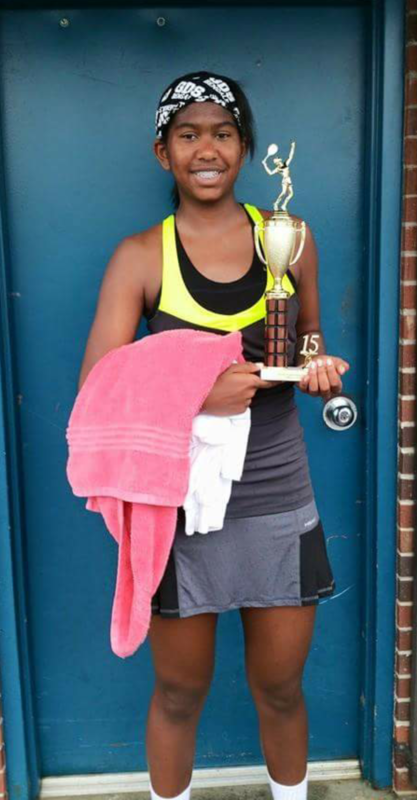 This was her first tournament of 2015 and only her 2nd tournament since moving up to the 16yr & under category but in this particular tournament, though she signed up for 16 & under (16&U) there was only one other 16yr old who signed up along with her. So the tournament officials said, “well we can just let you two play your match then you can just play with the 18 & under (18&U) bracket, too”. Well, the USTA folks gave the “OFFICIAL” official word which said Clarke and the other young lady would have to make a choice: either they stay in the 16&U group, play the one match and whoever won just that one match would take home the trophy OR they could enter the 18&U group and play the tougher competition where the players were much more advanced. In fact, the #1 & #2 seeds in this particular 18&U tournament were High School Seniors who had already been accepted to college and offered full-ride tennis scholarships (they were signing the following week). Clarke knew these two girls because they just happened to also be the #1 & #2 seed at her school where she is the #3 seed. In fact, they were the very reason why Clarke was seeded #3! But there were five other 18 yr olds (and the other 16 yr old) Clarke had never seen and didn’t know standing between her and the 18&U trophy. So, play one match where there’s a 50% chance of winning the 1st place trophy and 100% of coming home with SOME hardware (though most of it is plastic now) OR play with the much stiffer competition where there is just a slim chance that she would come home with even the 3rd place trophy? After a “quick” call to her coach/ mentor/ grandfather figure/ friend and Godsend to us all, JW Quick, Clarke decided it was better to play the tougher competition and more matches for the experience rather than play one match for the trophy. 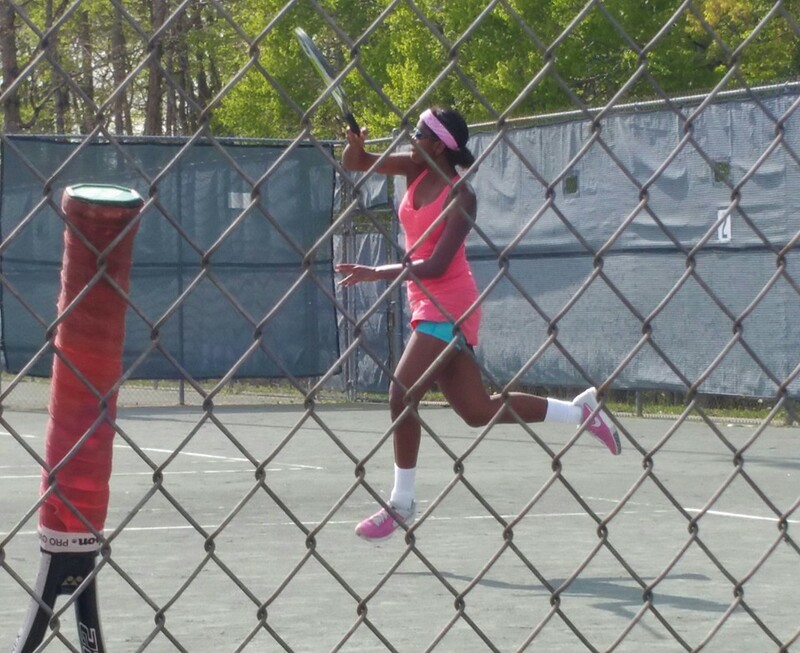 So she entered the 18&U tournament much to the dismay of the 16 yr old who was now forced to play 18&U or go home. Since Clarke and this girl were the youngest and originally signed up for 16&U, they were paired to play each other first. Clarke was a little rusty but in a little more than 90 minutes, she got through that match (split sets and a tie breaker) victoriously. She had about the same amount of time to rest and get something to eat before her next match. Now, had Clarke decided to play 16&U, we would have been on our way home with the 1st Place trophy! But Clarke chose to play 18&U. Her next opponent was the #2 seed who happened to be her teammate from her high school Tennis team. She was an aggressive player, strong and athletic like Clarke and she had a few more years of experience than Clarke. At times like these, we have grown accustomed to hearing and saying, “oh well, anything is possible”, but I knew the likelihood of Clarke’s winning was slim. In fact, we all had just watched this #2 seed obliterate her first opponent in half the time of Clarke’s match without even breaking a sweat. We could only hope that Clarke’s defeat wouldn’t render her feeling distraught or hopeless. Clarke played some of the best tennis I had seen her play to date. Her serves were fire! Her overhead shots had gotten so much better and her placement was spot on! Passersby and parents of other children who had already lost hung around just to watch the battle of these two titans of tennis (cue theme music from Rocky). Clarke lost consecutive sets (7-5, 7-5) and most of those games went to multiple deuces or she lost by a point. It was a great match to watch even though Clarke lost. We’ve taught Clarke that losing isn’t the end of the world but how you lose makes all the difference in the world. She was exhausted but Clarke had left all she had on that court. With first and second place now officially out of reach, Clarke was to return on Sunday to vie for 3rd place. The next morning Clarke could barely move, her entire body ached but she got up and got herself together. Her opponent lost to the #1 seed the day before in split sets and a tie breaker; yet another worthy and more experienced opponent. From the outset of the match it was easy to see that Clarke was stiff and needed some time to work the soreness out of her muscles and the kinks out of her gameplay. On any other day I believe, without a doubt, Clarke would have beaten the young lady but fatigue began to set in midway through the first set. Clarke would lose the first set in a tie breaker. As the second set began, I was amazed that Clarke still had enough power to serve some untouchable zingers but she had more trouble keeping her forehand in play on this day than the day before. The second set got lopsided early. The score was 4-1 and Clarke seemed to be completely spent; I thought she had given up … but I was wrong. Clarke came back … 4-2 … then 4-3 came quickly. Her opponent won another game and it was 5-3 but then Clarke kept coming, pulling strength from some place deep within her… 5-4 … then 5-5! Her opponent won the last two games for a second set final of 7-5 but it sure wasn’t easy; so now the door had closed on 1st, 2nd and 3rd place trophies for the 18&U tournament. People could tell Clarke was tired but marveled at her comeback, especially those who had been there a day earlier. They were still talking about Clarke’s grueling match from the day before! She had earned the respect of perfect strangers and imperfect friends. “… but technically”, the tournament manger continued, “you did beat the only other person who originally signed up for the 16&U tournament. So that means you won 1st Place in the 16&U group. And, Oh, by the way, and the points you earned playing the 18&U will be applied to your 16&U ranking”. He picks up the trophy we didn’t know existed and hands it to Clarke. My exhausted, defeated young titan’s face beamed with an outrageous joy that couldn’t be contained. Though she didn’t get what she had hoped to get, her hard work and discipline had gotten her something more than she expected. The lesson I learned from a 15 year old? Keep pushing. Regardless of how much you practice … no matter how hard you’ve toiled and it doesn’t seem to be working out in your favor … keep pushing. Employ all the gifts God has given you. In this case, quite literally, “the last was first”… and all the points she lost by not choosing to enter the 16&U tournament were restored for having the courage to take on the bigger, more difficult challenge. Funny, I never thought I could attend “church” on a tennis court… with my 15 year daughter as the preacher … living The Word right in front of us all. Now, had Clarke decided to play 16&U, we wouldn’t have even been there that day! But Clarke chose to play 18&U and we all were blessed… I hope you were, too. Beautiful – Raising a Beautiful Young Lady! Awesome juxtaposition. I could hear your voice and her’s through the inspiration that you felt and her determination. Great work pArents!